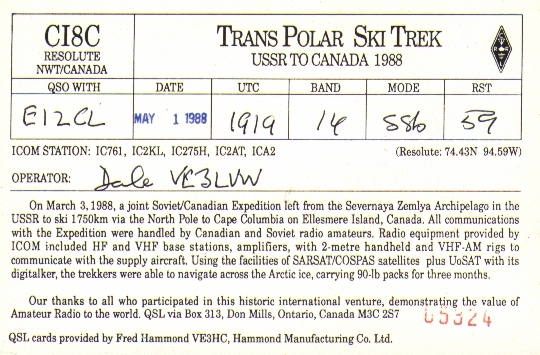 On 3 March 1988, a joint Russian/Canadian Expedition set out from Severnaya Zemlya Archipelago in the USSR to ski 1750km via the North Pole to Cape Colombia on Ellesmere Island, Canada. 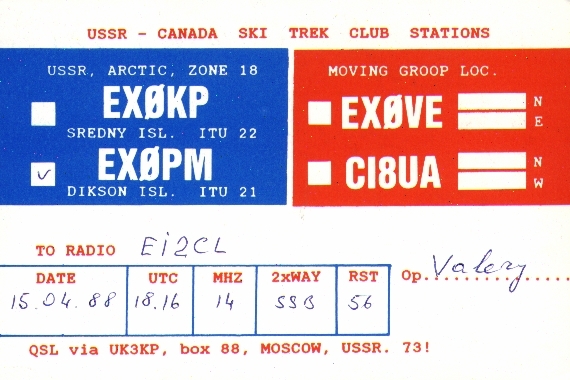 All communications with the Expedition were handled by Canadian and Russian radio amateurs. 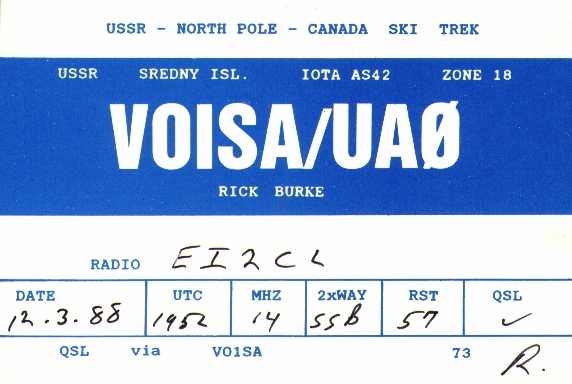 Radio equipment provided by ICOM included HF and VHF base stations, amplifiers, with 2-meter handheld and VHF-AM rigs to communicate with the supply aircraft. 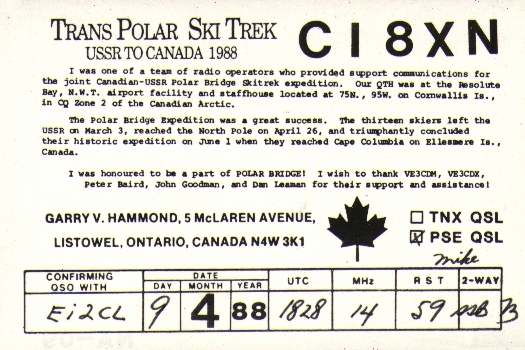 Using the facilities of SARSAT/COSPAS satellites plus UoSAT with its digitalker, the thirteen trekkers were able to navigate across the Arctic ice, carrying 90-lb packs for three months. 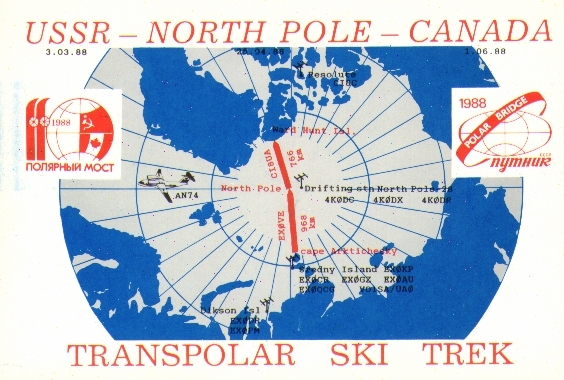 The skiers reached the North Pole on 25 April, and triumphantly concluded their historic expedition on 1 June on reaching Cape Colombia. See map. 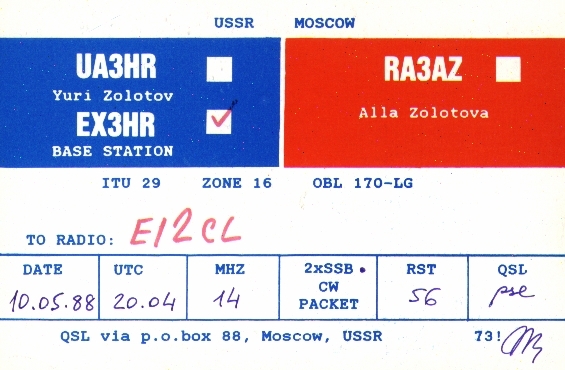 During the period I managed to contact some of the stations who had provided support communications for the expedition. 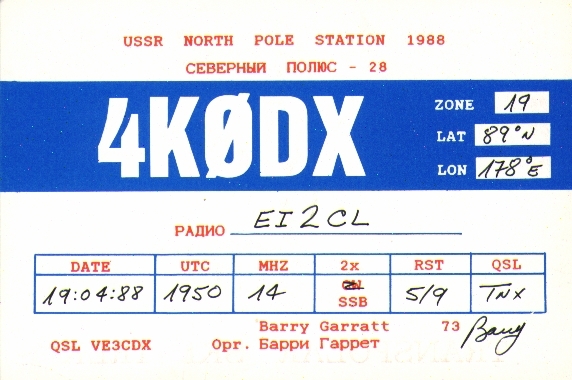 Although I could hear the moving group station EX0VE or CI8UA from time to time, neither station heard EI2CL in the pile-ups. 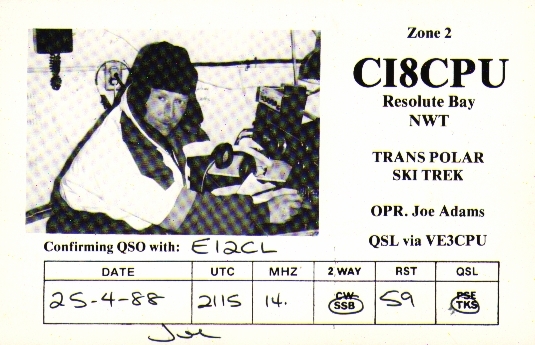 J 23 April 4K0DC "30km from the North Pole"
J 19 May CI8CR Resolute Bay, Cornwallis Island. 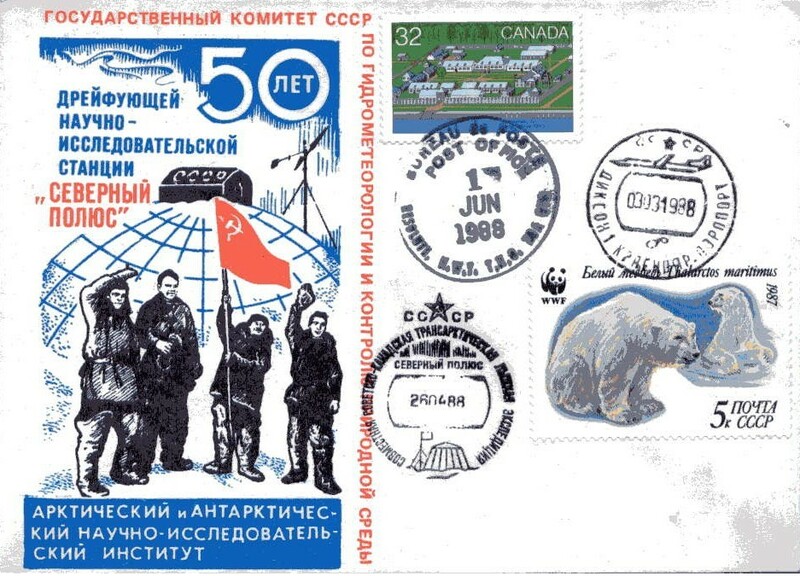 Added on 8 February 2003, a philatelic cover with postage stamps of USSR and Canada, cancelled at Krasnoyarsk Airport on 3 March 1988, at the North Pole on 26 April 1988 and at Resolute, NWT on 1 June 1988. To see, click here. 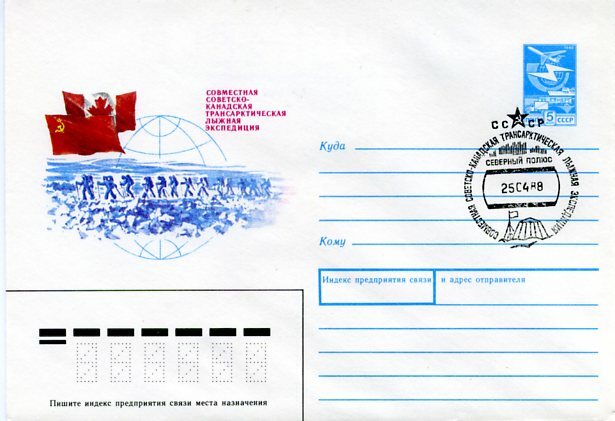 Added on 11 June 2010, a pictorial cover of USSR, with pictorial North Pole 25 April 1988 cancellation. To see, click here.